We are having warmer temperatures for a few days then another dip isforecast for 39 or 40 on Thursday morning. Husband Walter and I are taking a chance that we can protect four tomato plants that he set out for me today. I am sitting here grinning like an idiot as I think about that planting experience. The male-female communication—or lack thereof—about where and how I wanted them planted would have been hysterical but for the frustration it was causing Hubby. Fortunately I stifled the laughter. His patience was epic and deserved my respect. But I have to admit, even now I am having a hard time quenching the giggles that are threatening. I limited our purchase to four plants because that is as many as I had prepped space for. If I haven’t prepared a spot, I tend to let plants die before I can get them in a pot or in the ground. And that held true even before my stroke almost two years ago. February 23 we made the trip to Mobile Botanical Gardens to pick up the plants we had ordered online. The MBG folks had worked with local growers to have about 30 varieties of tomatoes ready early enough for prime time coastal planting. It has been a bit too cold since then to plant them, but I am sure some of the gardeners who live on Dauphin Island off the Alabama coast experienced warmer days much earlier than today and had their plants in the ground with a good head start. The varieties I chose take 60 to 66 days from transplanting to harvest. Three are supposed to produce cherry or grape-sized fruit. The fourth variety will be medium-sized fruit, I hope. I purposefully chose only varieties with fewer than 70 days between transplant and the onset of bearing fruit. 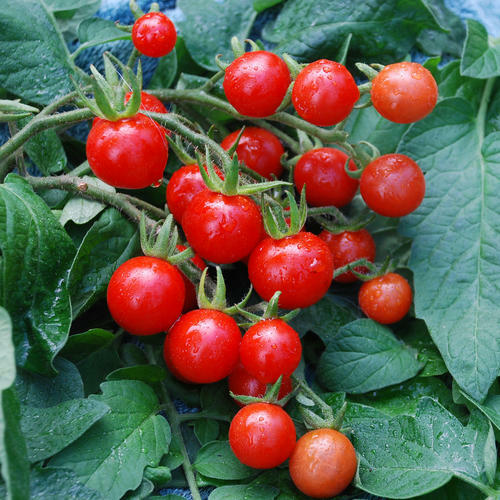 That gives us the possibility of enjoying fresh-from-the-garden tomatoes early May through June. By July the nights are so hot that most tomato plants stop pollinating here. My tomatoes that have produced beyond June have had a blah taste, except for the cherry varieties. That may not be true north of the coast. All four we planted today are touted as heavy producers. I hope that means enough for us AND the birds. I have tried other strategies to no avail. Maybe this year! Tightness in my shoulder and arm rearranged my therapist’s plans for today’s 8:15 a.m. session. I left feeling much better than when I arrived, though. Therapist Amy spent most of the session working on massage and manipulating my shoulder blade, arm and elbow to loosen them up. Flowers from our Georgia loved ones provided at-home therapy. 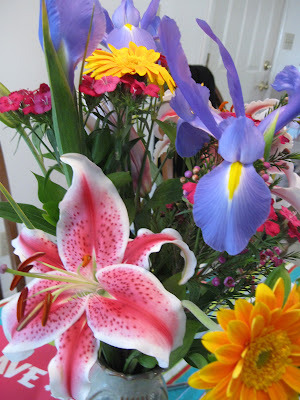 The bouquet that arrived several days ago included iris and stargazer lilies that were not opened fully. I thought they were beautiful when they arrived, but they have gotten bigger and even more flamboyant. I forgot this one’s name but I like its symmetry and cheerful color. One thing I love about cut flowers is that their eventual demise is expected. Even though I can kill flora from shrubs and veggie transplants to silk posies and plastic Christmas trees, the end of cut flowers is not my fault. 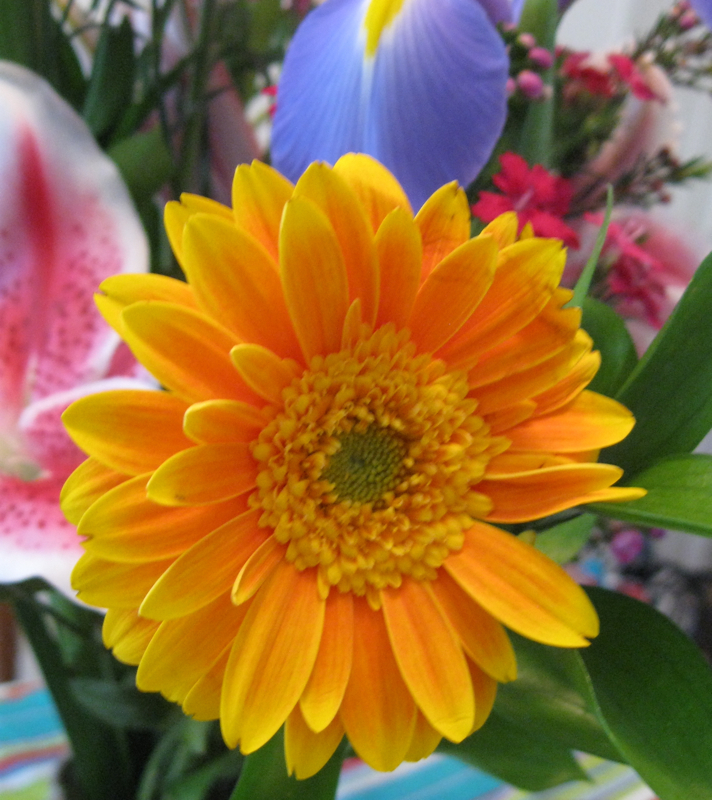 Hooray for beautiful, guilt-free flowers! Thank you Sarah, Walt, Luke, Nate, Charlie and Stella. Sure hope your new plants make it. It is soooooooo hard not to rush the growing season. I do it every year, in fact I bought some onions and Romaine lettuce yesterday. Sometimes I win, often Nature does. Love your reasoning about cut flowers. I will look at them differently now--with no guilt. You are making me antsy with all this talk about plants. We have had cold weather for several days. oh will spring ever arrive? Not too fond of raw tomatoes, but I do love spaghetti sauce!!! I hope you will be enjoying fresh tomatoes in a timely manner! Ours most likely won't be ready before mid-June. Hope they take. 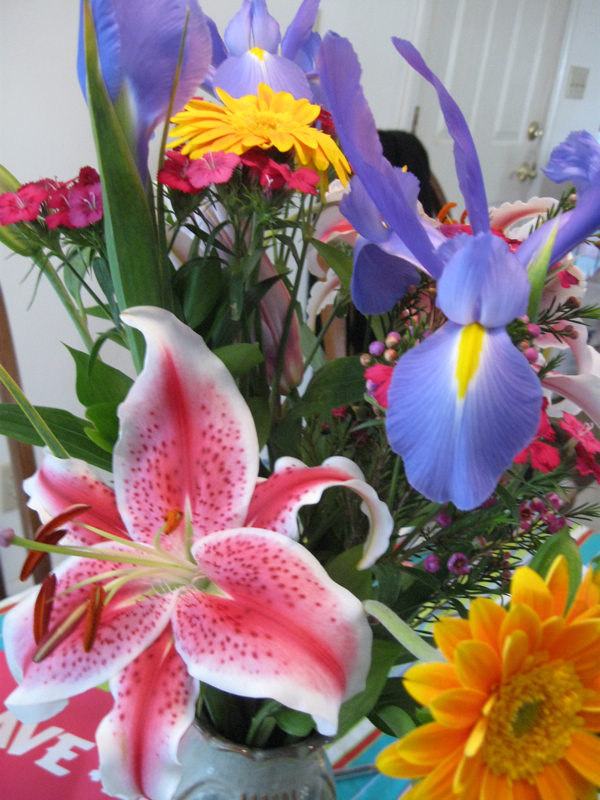 :) Just lovely flowers tho. You sound great. Love the cut flowers and the philosophy about them. Makes me feel better too. I remember when I was about 4 years old I "helped" my folks harvest their crop of tenderly tended tomatoes. Of course they were all green still! I lined them up so neatly on the back steps and proudly displayed them for my parents.. Didn't know about Fried Green Tomatoes though. Folks were Swedes from Minnesota. Hope you have a bountiful harvest of tomatoes!! 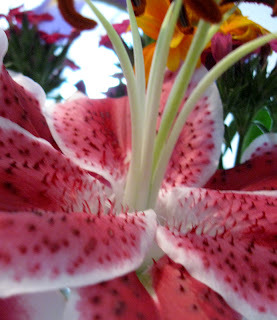 Your bouquet is gorgeous and your sense of humor is uplifting!